Thank you – for your continued support, love and commitment to our work of caring for the orphaned, abandoned, abused, traumatized, vulnerable and HIV positive children and youth. Myself, board of directors, management, staff members, the children and youth of New Jerusalem Children’s Home, we are humbled by your support. Your presence at New Jerusalem Children’s Home, during the Mandela month, has assured us that you are truly caring, we felt your warmth and we continue to feel your love to this day. You have given us the best gift of all times during the celebration of Nelson Mandela’s Centenary. The amount of time, you have dedicated and have spent with us, reminded us of words once said by Ralph Waldo Emerson, which says “The ornament of a house is the friends who frequent it.” New Jerusalem Children’s Home is still decorated by your visit. Allow me, to share with you, the focus and desires of New Jerusalem Children’s Home, as we enter the Woman’s Month. We are building a primary school and a multipurpose centre – within the walls of NJCH, I am sure that you might have seen the two buildings, which are under construction, while visiting the home. A building at the back, near the administrative block, is a school primary school building and it will be named Lanto Montessori Primary school, the 834 square meter building, is designed to accommodate 180 pupils, who will be given a Montessori primary education. The second building, located on the site of the kitchen, will be the multipurpose area of NJCH, making a room for all the indoor child related activities and an ITC room. The two mentioned buildings are still under-construction, we need your assistance. 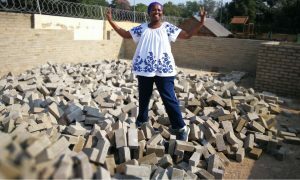 To complete the two buildings, New Jerusalem Children’s Home needs R1 452 999,99 – the needed funds will be used towards sourcing of the building material, which are Ready Mix concrete to cover the second floor sleep, this needs R178 710,00 – Roof Structure quoted R347 896,54 – Windows glasses costed R90 393,45 – Electrical wiring and lighting seating at R97 000,00 – Plumbing needs R86 000,00 – Floor decking R430 000,00 – Tiling R67 000,00 and Ceiling needs R156 000,00. All the mentioned building material come to a total of R1 452 999,99. During the Mandela Month, you have shown us that you want to help, you want to impact lives of children – give them a better tomorrow, children are educationally battling in a mainstream education, majority of NJCH children are pushed into the next grade, due to age – it is only a smaller percentage of our children who are fully enjoying the mainstream education and progress to the next grade through the understating of a curriculum – the bigger percentage needs a child centred education, a Montessori type of education, which we all can agree, that it is costly for a child to attain a Montessori type of education – with the completion of the building, it will be totally cost effective for New Jerusalem Children’s Home, to give all the primary school going children – an authentic Montessori education. The amount of construction work still to be done and funds needed, we – New Jerusalem Children’s Home – come to ask for your assistance. We believe that, should we not give children – the right educational tools now, they will not make it in life – a child’s ability to read and write, to understand the written word, turns to be a key need for a greater tomorrow, at New Jerusalem Children’s Home – we believe that once a child understands written words, its sounds and use, then a child will be able to open any doors of learning in his/her life. The total funds needed to complete a school and multipurpose building work is R1 452 999,99. New Jerusalem Children’s Home, believes in joint efforts by stakeholders, communities and corporate communities – with that being said – you are welcome to assist us with any amount or material towards the two buildings. The immediate need is the ready mix concrete.